Estihdaaf overcame a slow start to gain an impressive victory in the G3 UAE 2,000 Guineas over a mile on dirt during week six of the Dubai World Cup Carnival at Meydan, UAE, on Thursday, 7 February. The three-year-old Arch colt, dropping down in trip for trainer Saeed bin Suroor after finishing second in the extended nine-furlong Al Bastakiya Trial on Thursday, January 24, was sluggish leaving the stalls from the inside stall one, but soon recovered under Christophe Soumillon to take up the running after a furlong and a half. Estihdaaf held a narrow advantage until kicking on turning into the straight and went clear. He ran on well and was eased near the line to come home five and a half lengths ahead of Walking Thunder in 1m 39.87s. 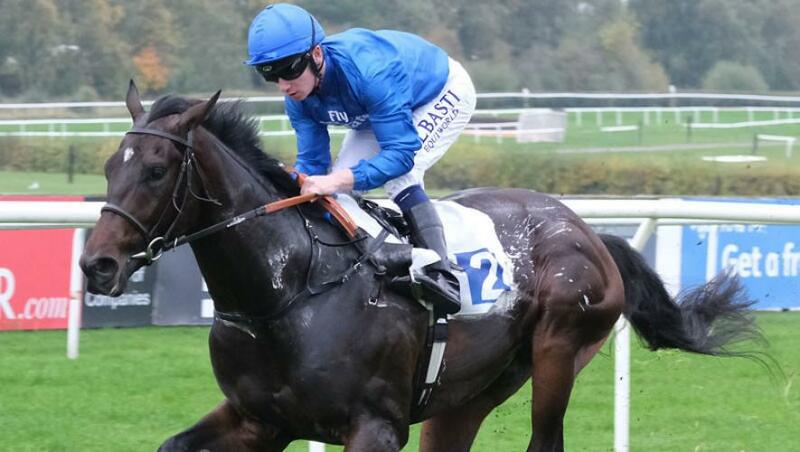 He provided Godolphin with an 11th success in the UAE 2,000 Guineas and Saeed bin Suroor, responsible for seven of them, said: “Estihdaaf looked more forward tonight and has improved since finishing second in the Al Bastakiya Trial, which gave us the confidence to drop him back to a mile. He is doing very well and improving. “I knew that the dirt would suit him from his breeding and I talked to the jockey beforehand, telling him to jump in front and be handy as that is the way he likes to work in the mornings and would keep him out of the kick-back. “Christophe Soumillon was forward with Estihdaaf and when he asked the colt they won well. “Last time, Estihdaaf came to finish second after being too far back, but I said to the jockey to lead if he could and the horse has improved since his last run. “He has options including the Al Bastakiya (Listed, 1m 1f 110yds) on Super Saturday (9 March) and the UAE Derby (G2, 1m 1f 110yds) on Dubai World Cup Night (Saturday, March 30). Christophe Soumillon commented: “Estihdaaf broke quite slowly, but fortunately I was drawn in stall one and, with the chute, I could allow him to jump a bit late. “I was quite confident when I hit the front because I knew that, when you have a horse who is a bit lazy like Estihdaaf, he is hard to catch if you can hit the front here and relax a while. “When I saw Walking Thunder racing four deep, I knew that I would have a winning chance. “When Saeed gets some ideas, he can make things work, and that is what is so great with him. “I wasn’t sure that the colt wanted to drop back to a mile because he showed less speed out of the gates last time. “I told Saeed that, if I had hit the front last time, I would have won. We did it today in a better race and we are all very happy. “Estihdaaf was a completely different horse on the turf at Meydan – he never found his action and wasn’t moving well. “He looks to love the dirt, which is a great point because the good races for the three-year-olds out here are on the surface.